Nowadays, background images, colors or patterns are important in not only design based websites but also blogs or common websites. However, there is another sad fact that it is not much easy to find background patterns that suits your website’s foreground content. It becomes more tedious when you have to check whether one pattern is suitable or not as you will have to do some code works to change the background pattern every time. In this situation, you can make use of a bookmarklet, which will help you in finding and testing the most appropriate background pattern for your website. Now let us have a look on this cool tool. 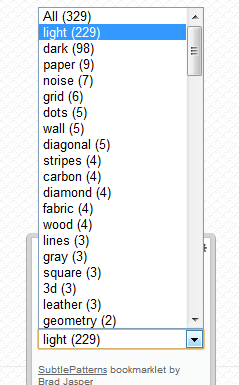 This tool, supported by subtlepatterns.com, is quite impressive and definitely useful for all web designers. Before jumping into the actual content, let us introduce you with bookmarklet. Bookmarklet is a set of bookmarks, which can perform functions other than just heading you to a specific page. In the case of Subtle Patterns, this bookmarklet is actually opening a small widget on the browser screen to adjust background settings of page without code plays. As said before, Subtle Patters has a huge collection of Background patterns. Users, most probably web designers can download these background patterns and use it according to their wish. Each download will comprise high quality background patters in different sizes. When compared to your long search for background patterns, using this website is useful and it seems that the website has a very good collection too. The website can also preview the specific background patterns so you can get a wide view before downloading. Brad Jasper is the man behind the Bookmarklet and it is available FREE. Using this tool, you can easily find matching background pattern for your website as well as seeing it live in your website with no coding stuff, which is easy for designers. Now we can have a look on how to use this tool. 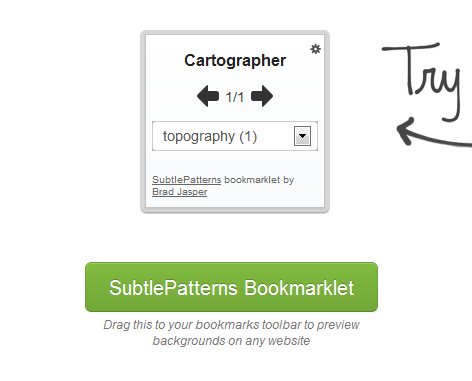 How to Use Subtle Patterns Bookmarklet? First, you have to go to Brad Jasper’s website to get the mentioned bookmarklet. Then drag that green colored button to your bookmark bar as said in the website. You are all done with the installation stuff. Then you can start playing with background patterns. If you want to change one website’s background patterns but want to see it live before applying, you can make use of Subtle Patterns Bookmarklet. Just go to the website (say Google.com) and click on the bookmark you have added in your bookmark bar. A small widget like given above will appear on the screen with a drop down option menu. You can select various background patterns from the menu and the site will be having the selected pattern in just a few seconds. 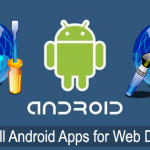 See we have selected various background patterns for Google using this widget. If there are different options in one category, you can use that well. For example in the first picture, you can see the widget displaying 1/329, which means there are 329 varieties in that category. You can see that various images by pressing the arrows in screen or your keyboard’s arrow key itself. Whenever you find a most appropriate background pattern for your blog, just click on the pattern name on bookmarklet. It’ll go to Subtle Patterns website, download that specific background pattern, and use it in your website/blog. Other than just changing the whole background pattern, this tool also allows you in change the background pattern of a specific area, say header. For doing that, you have to hit the settings button in the widget and select the area you would like to see effected. In this case, we have selected the upper portion and selected the background pattern. As you can see, there is a distinguishable change between divisions. This feature makes the tool more useful as you will have to apply multiple patters for multiple regions in a webpage. You can use this widget in any of websites and see the magic of background images. 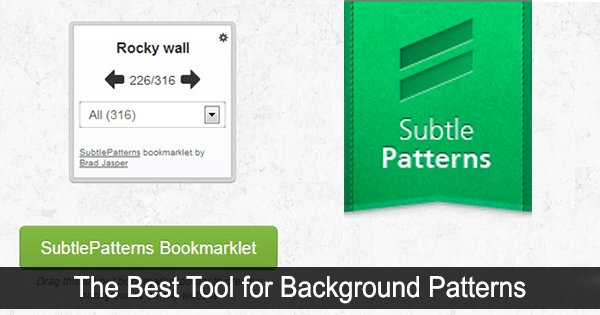 Suppose if you have a website and confused about what background pattern to choose, this Subtle Patterns bookmarklet will definitely help you in fixing it. We would surely say that Subtle Patterns Bookmarklet is necessary tool for every web Designer and it is quite simple to use. What is your opinion about this tool? Share it via comments. This helps so much!! It’s so easy and free. This is perfect for the spaces on my website that I don’t know what to do with, such a wide variety as well. Thanks again. I have known about this widget since long……. We can easily choose from a number of background patterns and we can make our websites look even livelier…..
Really nice post…….Thankx for sharing………….